Optimum No Rinse Wash & Shine 128 oz. Home > Shop By Brand > Optimum Polymer Technologies > Optimum No Rinse Wash & Shine 128 oz. Clean, shine, and protect in one step…without rinsing! Optimum has done it again! They’ve developed another product that marries car care and environmental responsibility – two things that are often treated as mutually exclusive. But, in this age of VOC regulations, Optimum is finding ways to enhance the beauty of automobiles and keep the environment safe. Optimum No Rinse Wash & Shine is a true breakthrough in car care. It’s a multi-purpose product that serves as a rinseless wash, a quick detailer, and a clay lubricant, depending on how much water you add. You don’t have to be a chemist to formulate your own excellent car care products; just follow the directions on the bottle! Plus, this product does not require rinsing. 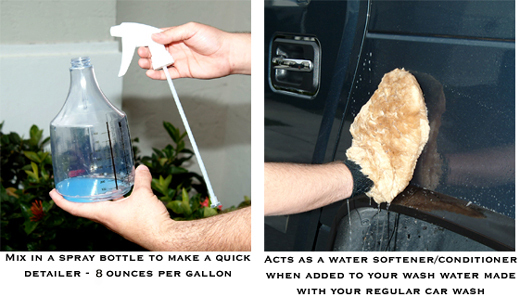 You can conserve water and still get your vehicle beautifully clean! Add 1 ounce of No Rinse Wash & Shine to 2 gallons of water to make an excellent no rinse car wash. Soak a microfiber towel in the solution and wash your vehicle with the wet towel. Dry each section with another microfiber towel. There’s no need to rinse! The lubricants and substantive polymers in the formula will protect your vehicle from abrasion as it safely cleans all vehicle surfaces. The polymers encapsulate dirt and cause it to drop to the bottom of the bucket. No Rinse Wash & Shine actually cleans the wash water as it cleans your vehicle! And it leaves your vehicle super slick, like it was just waxed! Add 1 ounce to wash water made with your regular car wash. No Rinse Wash & Shine’s advanced polymers and lubricants offer more surface protection and slickness than ordinary car soap alone. It acts as a water softener and conditioner to improve the quality of the water that touches your vehicle to provide the ultimate safe wash.
Add 2 ounces of No Rinse Wash & Shine to a gallon of water to make a super-slick clay bar lubricant. Wet the surface of your vehicle to provide a slippery protective layer beneath Opti-clay. After you’ve clayed each section, simply wipe it dry. This solution is as effective as any clay lubricant you can buy! Add 8 ounces of No Rinse Wash & Shine to a gallon of water to make an excellent quick detailer. Fill up a spray bottle with this mixture and use it to clean and shine your vehicle, just as you would use a traditional detailer. The proprietary polymers bond to the paint surface to protect it from abrasion and micro-marring as you clean. The incredible formula leaves your vehicle extremely slick and glossy, like you just applied wax! One bottle of Optimum No Rinse Wash & Shine gives you 4 essential car care products! And the performance of each is as good as or better than any existing, one-purpose product. Compare for yourself! No Rinse Wash & Shine is environmentally safe. 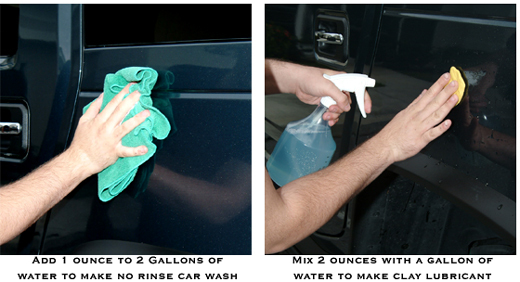 No Rinse Wash N’ Shine eliminates the run-off that occurs from rinsing a soapy car. The rinse water runs into storm drains and out to bodies of water inhabited by fish and wildlife. Water that runs into storm drains does not receive treatment at a waste water plant before reaching a body of water. All the soap, oils, and dirt that was on your car is now in the nearest lake or stream. By using No Rinse Wash N’ Shine, you are protecting the water quality because everything that was on your vehicle ends up in a towel and not in a local pond. No Rinse Wash & Shine is water-soluble, biodegradable, and meets all water usage laws established by the federal Clean Water Act and the Environmental Protection Agency. You can wash your vehicle in the winter. Since No Rinse Wash & Shine requires a minimal amount of water and there’s no need to rinse, you can wash your vehicle in your garage. This makes winter detailing practical and convenient. No Rinse Wash & Shine helps you conserve clean water. People living in beach or island communities are familiar with water restrictions. These may include putting sprinklers on timers or restricting household water usage to just a couple of hours a day. These laws are in place to conserve water where usable water is in short supply. Optimum No Rinse Wash N’ Shine allows you to conserve water while washing your vehicle because there’s no need to rinse. One gallon of water is all you need to wash your vehicle as well as any ordinary car wash. You can still enjoy a clean vehicle at home and abide by local ordinances. No Rinse Wash & Shine replaces many products that are not safe for the environment. Quick detailers were one of the first categories of products affected by VOC laws. Because most are formulated with petroleum byproducts, quick detailers have all but vanished from retailers’ shelves. No Rinse Wash & Shine is not a quick detailer but it does increase shine and slickness as well as any quick detailer on the market. With its state-of-the-art polymers and lubricants, it enhances your vehicle’s finish without releasing harmful compounds into the air. You only have one bottle to throw away. If you buy a separate quick detailer, car shampoo, and clay lubricant, you’ll have 3 bottles to throw away. If you replace all those products with one bottle of No Rinse Wash & Shine, you’ve only got one bottle to toss. Plus, all Optimum’s bottles are recyclable. Optimum No Rinse Wash & Shine just makes good sense! It’s safe and effective on your vehicle, safe for the environment, and easier on your wallet than buying multiple car care products. For a clean, shiny vehicle, No Rinse Wash & Shine is all you need! Optimum No Rinse Wash & Shine 8 oz. Optimum No Rinse Wash & Shine 32 oz. So far I've tried the product on a paint jobs ranging from 33 to 7 years old in the prescribed dilutions. Very satisfactory results in all applications and I'm hard to please. Went on and off as described and with ease. I'll continue to use and will recommend. ProsEasy to apply/remove and works as professed.